Nobuyuki Matsuhisa, known as Nobu, is known among celebrities as not just simply a fine chef or a passionate chef, but a great chef! He has restaurants in nine cities in the United States, Europe and Japan and one cookbook. 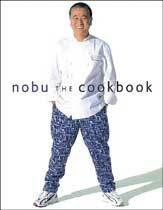 Nobu the Cookbook is Mr. Matsuhisa’s first book and is a seafood-lover’s, sushi and sashimi-lover’s dream come true. In fact, I would dare say it’s a dream come true for anyone who has eaten at one of his restaurants and has wanted to enjoy his delicacies at home. He was trained in Tokyo, and has run restaurants in Peru, Argentina and Alaska. He opened his first restaurant in Beverly Hills in 1987. Two striking elements of the book caught my immediate attention. First, the picture of the man himself on the front cover  it is inviting, welcoming the reader whole-heartedly. Secondly are the pictures by Fumihiko Watanabe which bring the recipes within vibrantly to life. “COOKING IS MY LIFE and this book is a straightforward and honest expression of that life  of me as a man and a chef.” His style is “Nobu-Style,” based on Japanese cooking with North and South American influences. The first chapter, Ingredients, Techniques, Equipment and Measurements, explains in detail everything a novice or skilled sushi/sashimi lover needs to know. Furthermore, the recipes are accompanied with in-depth explanations on how to prepare all the seafood within. As the ingredients used in the recipes come from Japan, the chapter on suppliers will make obtaining the necessary ingredients easier. The combination of cilantro and monkfish in Nobu’s Cilantro Soup with Monkfish is the first delicacy to catch my eye. The idea of combining these two ingredients is intriguing. Mr. Matsuhisa has created a new trend with his Soft Shell Crab Roll. Once served only deep-fried as an appetizer, thanks to a customer’s request it evolved into its own sushi-version. Fruit Toban Yaki is a unique, baked fruit medley in a sauce perfect for summertime, utilizing bananas, strawberries, cherries, papaya, blueberries, and much more.